At The Paediatric Dental Practice, we’re all about preventive care! We encourage excellent dental hygiene for kids through regular dental check-ups and cleans. We also work closely with our patients and their families to set up effective and fun dental care routines at home, with great advice about products, techniques and maintenance schedules. For parents of little first-time dental patients, there can be many whys and hows. Here, specialist paediatric dentist Dr Michael Chong from The Paediatric Dental Practice answers your questions. How often should children come in for a dental check-up and clean? Studies recommend that frequent dental check-ups and cleans – at least twice a year depending on age – are very beneficial, not only for your child’s oral health but so they get used to seeing the dentist. If they come in regularly, by the time they’re three to four years old, they’ll be familiar with the procedures. Can my child visit the dentist once a year instead? “Yes, we can change it to 12 months, but it’s on a case-by-case basis,” explains Dr Chong. “During your child’s first dental check-up and clean, we do a caries risk assessment – we look at the health of their teeth and assess the risk of them developing tooth decay or caries. There are also social factors that affect their overall risk. Will my child see a dentist or hygienist? First, they’ll see one of our specialist paediatric dentists for a comprehensive dental check-up. Then, if everything looks good, your child will go to one of our oral health therapists for a dental clean, as well as learn how to brush and look after their teeth. Dr Michael Chong and the other specialist paediatric dentists are always here in the practice if you have any questions that come up during these appointments. If your child’s teeth need further work, you’ll be involved in the decision-making process of their treatment and we’ll talk through all the options with you. If you have been referred to us by your general dentist for a specific reason, we will refer you back to them at the end of that treatment. Do children find that a dental clean appointment hurts? “No, the children that see us regularly love coming in!” says Dr Chong. What’s the difference in seeing a paediatric dentist vs a general dentist? “The actual dental check-up and clean is the easy part, so if the patient is confident, it doesn’t matter who they see,” says Dr Chong. “If the child is apprehensive, the difference in seeing us is that we have the training experience to make sure they get through the appointment in good spirits. We want them to come back because they feel happy and we can build on this relationship. Are there any other tools in your preventive dental care toolbox? Firstly, we’re very mindful of only taking an X-ray if it’s justified or required and are careful to use this as little as possible. It’s a diagnostic measure that helps to catch any problems early (most decay in children is harder to diagnose than adults). Usually, we look at doing an X-ray every 24 months depending on the child’s age, risk factors and history. We also use the very latest in 3D imaging in the practice (still not available in most dental practices). It’s particularly useful in diagnosing certain problems very early. This preventive dental treatment uses the same filling material (called composite resin) that’s used to do fillings in decayed teeth. The technique involves applying a protective coating over the grooves (fissures) on the top of the tooth to prevent decay. We mostly use composite resin because it lasts longer and works better, even if it’s trickier for us to place. Studies show it’s superior than other dental restorative materials like GIC or glass ionomer cement. Is your little Dora the Explorer or Bob the Builder ready to come in and meet the dentist? 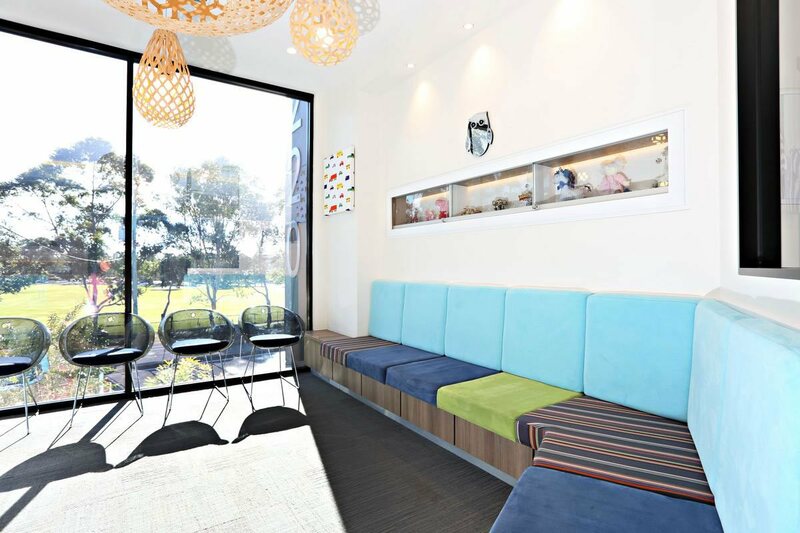 Call us now for an appointment on (07) 5597 2000 or book online. You don’t need a referral.